Wow, May. How did it get to be May already? I guess that means we should do a recap of the month (and also March, because I think I skipped a goal recap then.) 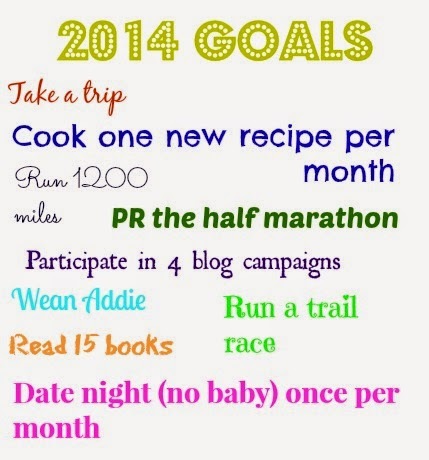 So let's take a look at what I wanted to accomplish this year, shall we? Since I get to report on 2 months, I can say that I made SOME progress. I cooked one new recipe. I ran a few miles. I read one more book. Jason and I had 3 (!!!) date nights. Well, one was a date day (I ran a race and he worked in the morning, then we went to lunch and a brewery for a few hours. We went and had dinner alone at our favorite restaurant the day before we moved. The weekend we moved we went and had dinner alone. I finished off my ambassadorship for the Medical Mutual Glass City Marathon, and that was a lot of blogging. Overall, I would say things are looking up!